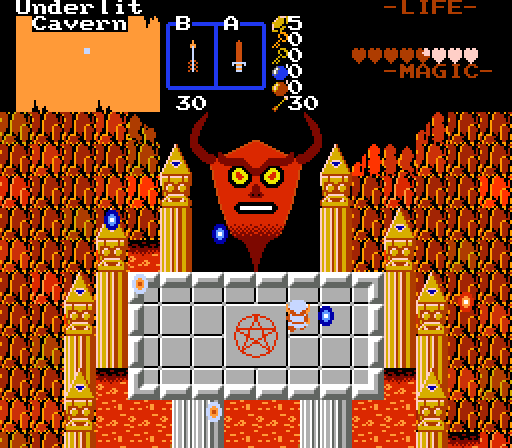 What is Prometheus doing in this tileset? I voted Jared. You're doing wonders with DoR. Jared - Really interesting scenario going on here. I like the overall design and atmosphere a lot, it definitely looks and feels very ruined, so really good job here! klop422 - Pretty fitting for this week, given the number and all It looks pretty interesting and the devil face near the top looks pretty comical to me lol. Pretty neat work. Orithan - Looks like a nice starting area, I dig the design quite a bit. 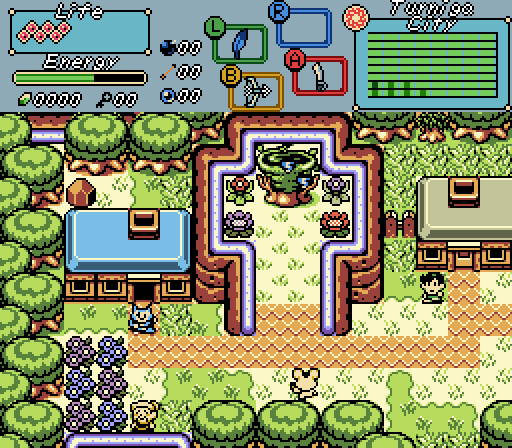 I see you've also gone for the HGCO route with the health bar at the top, which is pretty neat. All around good work. Lut - This looks pretty cool, I really like how you combined overworld and dungeon elements like this, and there's a lot of unique screen design that comes out of it. The rain effects could be worked on a little so they don't look so boxed IMO, but I love what you got here. Shoshon - This is looking very Yuurei-inspired, so that's pretty neat. I take this is like a wasteland kind of area and I'm pretty interested in seeing where this goes. Pretty tough week for me, I'm going for Lut with Jared in very close second. Yeah, I was considering making a serious devil face, but then I realised I have very little skill in proper spriting, so I gave it the comical angry guy look. Jared: I really like this one. Really nails the ruin look. Took me a moment and a change of device to work out what the ripped up banners were on the ground, but that's really my own fault. What I will say is that the sideways pillars are perhaps a little odd, but I think it works decently well. klop422: This Those is in not charge my would best be work pleased but, if I you sorta voted like here. it. 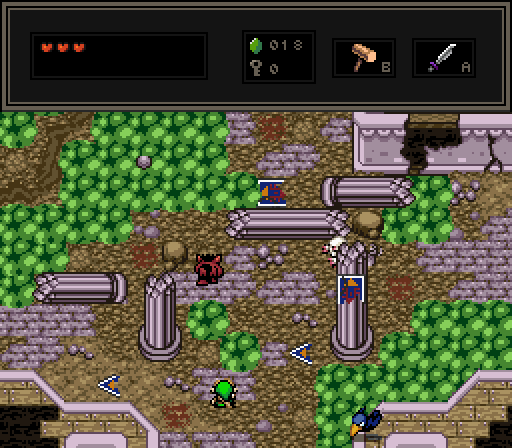 Orithan: I'll admit I have a soft spot for the low-bit tilesets (Classic, GB, etc. ), but this is a really good screen even without taking that into account. I especially like how you managed to put in a slope with the weird perspective effects that one can do. Lüt: It's a good screen, and I like it a lot. Don't have that much to say about it, though. Shoshon the Elegant: Again, I like it a lot. It has a very dark feel to it, which is fitting, I guess. Again, don't have that much to say. Nulled, of course, but would have voted Orithan, with Jared close behind. Jared: This looks much better on my PC than it did on my phone. I think the pillars are quite nice personally. Although the one with the shield on it does seem a bit off to me, in some way. Still lovely shot. klop: Well, someone made a shot that matches the week. Orithan: Well done screen, as always. Really like the scar over your MC's eye. Lut: As always, a nicely put together shot. I should probably start doing gifs too. Shoshon: This is the second screen in a Prometheus metroidvania inspired by Yuurei. That thing's a screen for 1SM, I'm just using whatever was in that quest file. 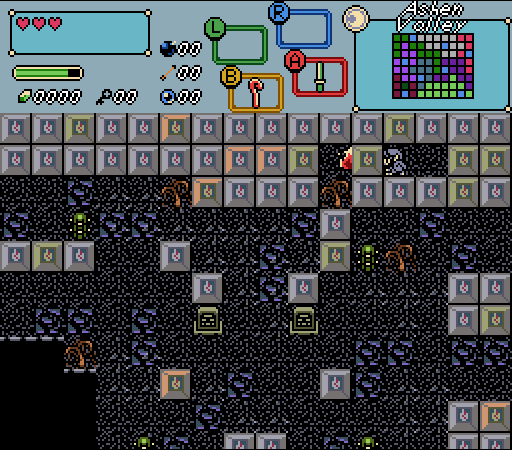 Plus, 32x32 tiling in a 16x16 game is often considered a luxury. And this one's drawn as 32-wide horizontal tiling anyway, so the vertical shift wouldn't work. I should probably start doing gifs too. It's a bit annoying to set up the frames when different combos animate at different speeds, but lowest common denominators among animations work wonders. Anyway, excluding mine, probably would've gone for Jared's with the nukage. Orithan's looks quite cozy, klop's looks quite opposite (though still nice layout) and I definitely see the Yuurei influence in the last one. Looks fun. Someone took the rain from my QLC set and added it, but if someone looks at my updated QLC set I edited the rain. With 36.11% of the vote, the winner of Screenshot of the Week 666 is Orithan!